What better way to show you know? These super cool Gift Cards can be used to buy tall nachos and frosty beers after skiing at the Elk or book a room on the best powder day of the year. The list of ways to spend it at the hotels, Alpine Inn Restaurant, and the Snorting Elk is an awesome way to create special moments just when your loved ones want it. After a big powder day going bell to bell, who wouldn’t want to order up the Boondoggle Pizza and a pitcher of Elk Frost? They’ll love you for it! 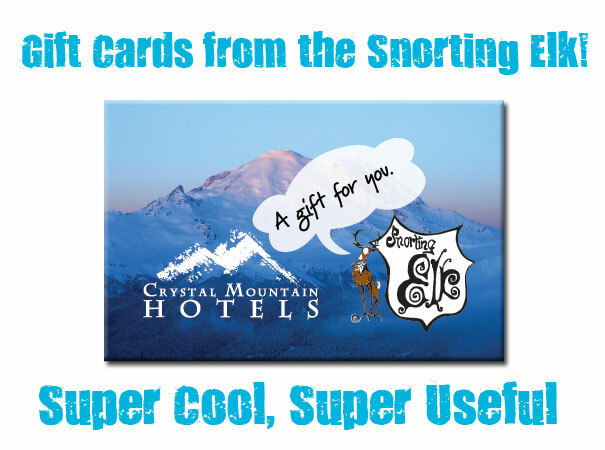 Gift cards can be purchased through the Hotel Office or Snorting Elk Cellar. Call 360-663-2262 for purchase over the phone and we will mail it out or hold for pickup in the hotel office. Customers can purchase in person at the Village Inn Hotel Office or Snorting Elk.